The last time I saw Close Encounters of the Third Kind was in film school. My professor lectured before the screening, prompting us to view the film in terms of the 1970s American zeitgeist– the disillusionment with the government, the decline of the traditional family, and the relationship Close Encounters inevitably had with Star Wars. Roy Neary dominated our conversation in that class and many of the classes to follow. Nothing we talked about hasn’t already been said; it’s undeniable that Roy’s morally questionable character arc is both fascinating and uncomfortable. Was Spielberg playing out a male escapist fantasy, or was he trying to reconcile his relationship with his own father, or, as critic Matt Zoller Seitz recently suggested, is he reacting to trauma? The issue with Roy’s journey in Close Encounters is an enduring one because, despite the fact that it’s emotionally relatable, it remains logically unanswered. And it’s not just unanswered to the audience. I was particularly moved during this viewing by the mashed potatoes scene– the way Roy’s son begins crying as he watches his father play in his food. The utter confusion on the child’s face and the hot tears that overcome an 8-year-old who later rips into his dad for being “a crybaby” is indelible. And the confusion and questions dominate the other characters too. Roy’s wife (a strikingly sympathetic performance by Teri Garr that I appreciate more and more) urges Roy to go to therapy so that they can “figure it out.” The fact that neither she– nor Roy– understands what is going on is ultimately what tears them apart. Even in the end, when the UFO is directly in front of the characters’ faces, a lack of knowledge permeates all interactions. “I do not know what is going on,” Lacombe repeats over and over to his translator and the military officials. “What are we saying to each other?” the young musician asks as he plays on his keyboard. While he can keep up musically, he has no clue what’s going on. When Lacombe signs his solfege phrase to the alien– Re Mi Do Do So– both he and the alien smile in response– but to what? Why? Roy’s choices are, logically, morally wrong. But the reason we can let it slide is because we emotionally understand. The idea of being meant for something greater, for seeking after that thing we can’t quite describe– those universal, indescribable human emotions are personified through Roy. 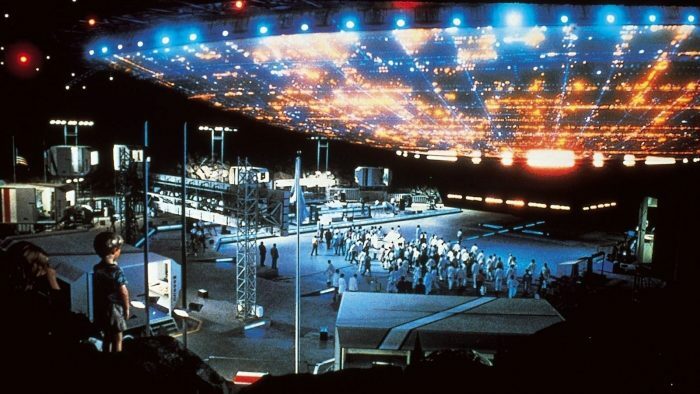 Like the Indiana Jones films, E.T., and Jaws, in Close Encounters Spielberg delves into the ideas of the unknown and uncharted– the unknown not being something of abundance in the 1970s. We had landed on the moon, charted the globe via satellite, and the newfound abundance of information via television only brought about disappointment and cynicism due to Watergate and Vietnam. Unlike Star Wars, which begins by the camera tilting down from the stars, Close Encounters ends by looking up at them, suggesting that perhaps there are still beautiful truths to be found in the unknown. Spielberg says that the message of the film can be found in the song “When You Wish Upon a Star”– and the film does give hope that wishing and dreams and the impossible really are possible after all. The entirety of the film focuses on the ineffable, transcendence experiences that go beyond words. Experiences that defy science, and therefore must be expressed through art. So, no, the film doesn’t answer questions– the fact that they’re unanswered is what gives hope. © 2019 Merritt Mecham . Powered by WordPress. Theme by Viva Themes.